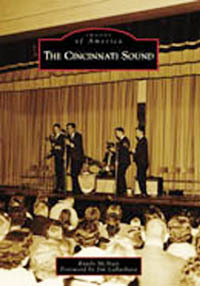 From 1940 to 1970, Cincinnati overflowed with musical opportunities. Hank Williams recorded his hit “Lovesick Blues.” Andy Williams, Rosemary and Betty Clooney, and Doris Day appeared regularly on WLW Radio, which also broadcast Boone County Jamboree. Then came the network television show Midwestern Hayride and stardom for Kenny Price. Meanwhile, King and Fraternity Records released hundreds of hits for James Brown, Hank Ballard and the Midnighters, Cowboy Copas, Lonnie Mack, and the Casinos. In the late 1960s, the Lemon Pipers sang “Green Tambourine,” and rock bands ruled Coney Island’s Moonlite Gardens. It was a wild, incredible ride while it lasted, and it left such an indelible impression that today Cincinnati is remembered as one of America’s top music capitals. Randy McNutt is a former independent record producer who discovered the hit songwriter Wayne Perry and produced a nationally charted single and made others for the Avco-Embassy, Fraternity, and Counterpart labels in the United States, as well as albums for the Gee-Dee, Hydra, and Rockhouse record companies in Europe. He is the author of the music books Guitar Towns, Too Hot to Handle, and We Wanna Boogie. He lives in Hamilton with his wife, the writer Cheryl Bauer, and their three cats.